VICTORVILLE – Attempting to settle unpaid hotel taxes from a few remaining establishments, the City Council on Tuesday held a public hearing to pass a resolution that would place liens on hotel properties delinquent in their transient occupancy taxes. The council passed the resolution 5-0 Tuesday night, while allowing staff to work out a payment schedule with one of the three remaining delinquent hotels, Days Inn Victorville, during the window of time it takes for the approved lien proceedures to take place. “It’s going to take some time upon the adoption of the resolution, even to implement the provisions of the resolution, which is to lien the property, which will provide some time for these property owners to make the city whole in respect to these amounts,” City Attorney Andre de Bortnowsky said, agreeing with Mayor Jim Cox’s intention to honor the request of Days Inn spokesperson Chris Chauhan to meet his hotel’s obligation. The resolution confirms assessments, more than $30,000 in owed taxes, as well as the proceedings for the unpaid transient occupancy taxes from 2010 to 2012. However, de Bortnowsky pointed out that the Council should be careful of the appearance of preferential treatment. “The concern I have is that you are treating these individuals differently from those hotels that paid their transient occupancy taxes without asking for a payment schedule,” the City Attorney said. De Bortnowsky said approval of the resolution should be appropriate so long as staff works “with the property owners to try to get this resolved as quickly as possible” during the window of time it takes to implement the lean procedures. 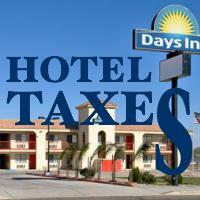 According to an Oct. 1 staff report by Webb, results of the transient occupancy tax audit performed by TCS-Tax Compliance Services for 2010, 2011 and 2012 showed that Travel Inn ($9,364.45), Days Inn ($7,826.83) and Budget Inn Kentwood ($12,822.96) had substantial errors in their tax reports totaling $30,014.24. In another matter before the city on Tuesday, the members of the City Council unanimously approved, without discussion, a judgment settling the case of a lawsuit with Tetra Hydro Cannabiniol – which enforces a permanent injunction against the former medical marijuana dispensary operation. The judgment claims that Tetra violated both the California Building Code and Victorville Municipal Code in its operation as a medical marijuana dispensary and its failure to obtain “city-issued entitlements which are required for all land uses and businesses,” according to an Oct. 29 staff report by City Attorney Andre de Bortnowsky and Deputy City Attorney Jennifer Mizrahi. The terms of the judgment stipulate that Tetra is permanently prohibited from operating a medical marijuana dispensary anywhere in Victorville, whether fixed or mobile – and that the city retains its right to recover full legal costs against Tetra, including attorney’s fees and enforcement costs incurred by the city. Last, and most noteworthy, Margie Simpson addressed the City Council at the end of Tuesday’s meeting to thank the city for its support and participation in last Saturday’s Old Towne Festival. Simpson gave special thanks on behalf of Barbara Powers, president of the Victorville Old Town Route 66 Historic Society, saying “Our first festival was small but successful,” and that more than half of the vendors committed to next year’s festival. For more details on the event, view the community announcement submitted to the Civic Bee at civicbee.com/2013/11/04.